At the beginning there is the man with a jovial smile, eyes full of experience and a look that mocks life and the vagaries of fate. If Kazem takes refuge in good humor and laughter, it is to exhort elation to take over the distance, the war and the disorder of the world. And then there is the undeniably talented artist who merges with the man to translate a thousand emotions on colorful canvases. There are faces, strangely familiar features, a cry, a state of astonishment, a joy … points that gather little by little like the moments that weave life. Suddenly the images appear, as bright as a sunbeam blazing a path between the clouds, silhouettes who cry out freedom to the face of the world and colors that call to live. Although his art is considered expressionist, it remains for many atypical. From clay to coffee grounds to the vivacity of colors, the artist uses all materials and delegates to his hands, guided by his heart, the freedom to paint and create. Kazem was still in Syria when his works, as much as his character, had caught Michel Archambault’s attention. In Paris, the latter is in a hurry to show Kazem’s work to Francis Bacon saying: “It’s something of your family”. After considering the work of the Syrian artist Bacon then replies: “But there is no family, there is him, and he alone, this creator who will defend himself, this man is going to make his own way”. Bacon was right; Kazem made his own way and still pursues his own approach. The characters he paints are the reincarnation of the human soul in its entire splendor but also in its entire fragility. In his paintings, there are places without address inhabited by events that never stop reproducing and emotions that, through this liberating artistic expression, become eternal. Nothing can stop Kazem Khalil’s rivers of colors, which seem to flow for millennia in the artist’s blood and which on the canvas disperse a sense of movement. They are living emotions that summarize the past and the present, not only of these of the artist but of our entire Orient of dreams and blood. His identity does not end with a unique culture but transcends all boundaries and sums up epochs with a profoundly universal expression. “A peculiar state of delirium circulates in the space of the canvas, like a winged anticipation whose flight space attracts us and invites us to settle down, to get to the bottom of things. Seeing the space, the wings seduce us and encourage us to fly freely”, as expressed by the great poet Adonis about Kazem’s “Metamorphoses” series. The poet sees in these works ships breaking the sea, which do not seek to dock but sail and wander in the middle of the waves, where freedom takes on a universal dimension. A “cloud fabric” emanates from this light at the edge of the paintings, as if to lift the spectator to the highest point where it is possible to observe the spirit and its torments. In Kazem Khalil’s art, each emotion has a distinguished beauty that the artist excels at communicating to the viewer through the grace of colors, varied but yet united like raindrops. Water droplets that like a river sometimes serene and sometimes agitated, splash the space of our souls in the way of these differences that form our humanity. Al Omari, who left Syria after the start of the Syrian war in 2011, was granted asylum in Belgium. He currently lives in Brussels, and began work on The Vulnerability Series about three and a half years ago. 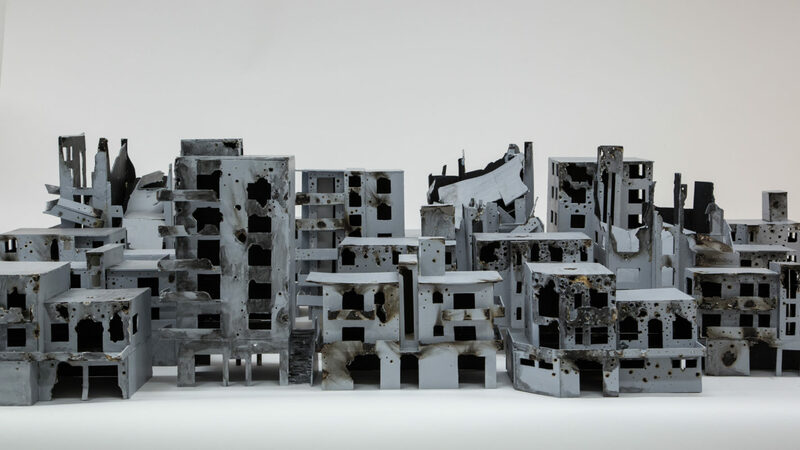 Launching his career in Damascus shortly after the outbreak of the conflict in Syria in 2011, Abdalla Al Omari’s recent paintings describe the experiences of civilians, particularly children, who are caught in the crossfires of war. Al Omari graduated from the University of Damascus with a degree in English Literature while also attending the Adham Ismail Institute for Visual Arts. Later, he worked with pioneering Syrian artists Ghassan Sibai and Fouad Dahdouh.